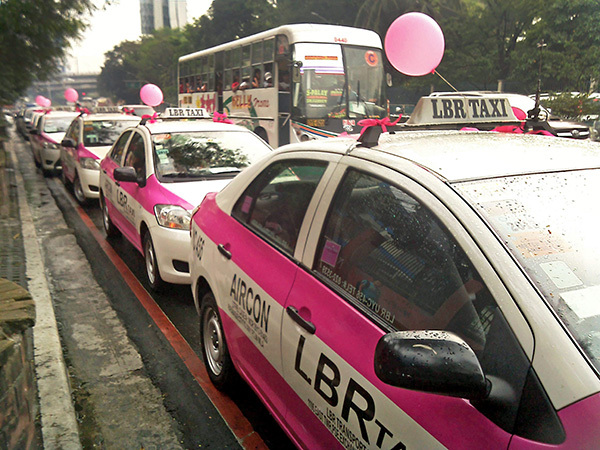 The launching of the LBR Transport, Inc. pink taxis, was highlighted by a motorcade from the LTFRB Central Office along East Avenue to the Quezon City Memorial Circle in Quezon City. Sixty units of the public utility vehicles dubbed first ladies: pink taxis are owned and operated by TV host and actor Luis Manzano. These are added features of the Land Transportation Franchising and Regulatory Board (LTFRBs) Pink4 Project that seeks to ferry the special group of commuters particularly the women, children, senior citizens and disabled especially during rush hours to address their safety to their destination. Reports said the LBR taxis were sporting pink stripes and double pink ribbons on their top lights and drivers were in their pink polo shirts. According to Manzano and his business partner Bong Medel, the fare rate will be maintained and they further disclosed that this is part of their obligation to the public. Medel also revealed that the drivers have complained on the cut in the flag down rates affecting the operators; however, he said that they have complied. With this, he confirmed that around P100.oo per 10 passengers a day will be lost from the drivers. Meanwhile, the RRCG Bus Inc. has likewise fielded its first pink bus plying the Quiapo-Cainta route from 4:00 to 10:00 in the morning; and 4 p.m to 10 p.m. In February, just in time for the hearts day, the 14 pink jeepneys were launched plying the Pateros-Guadalupe route while 16 UV Express vehicles rendered transport services to the Trinoma – Tandang Sora route. The pink jeepneys, bus and taxis have one thing in common; they are all designed for a worthy cause. The Pink4 Project is a welcome relief for the special group of commuters in Metro Manila as LTFRB is toeing-the-line to advance their advocacy and make it work for those it seeks to serve.